In a large pot, saute' the garlic and onion with a little bit of oil until they are clear. Add the split peas and 6 1/2 cups of water. Let boil for 45 minutes stiring occasionally. (I use a pressure cooker, so I just heat to high for 6 minutes and they are all done.) When the peas are cooked through, add the seasonings to taste. I like about 1 tea fresh ground black pepper and 1 tea Lawrey's season salt. The kids love this meal because it is the only time I make fresh crispy bacon. We crumble that into our soup before eating it. Last night, Alex had 3 bowls of the stuff. Thank you Val! 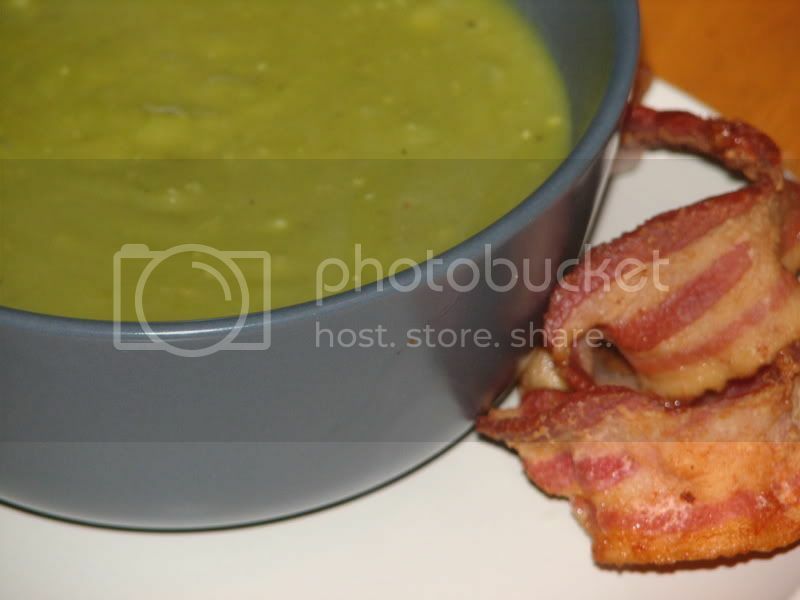 My dh loves split pea soup but I have been afraid to make it. i have never even had the opportunity to eat split pea soup and wouldn't even know how it is supposed to taste. I do however have a bag of spilt peas and some bacon in my freezer. I also have a need for an evening meal. I think I will try this soup. That sounds so easy! I'll have to try that.